A huge Observation wheel is in the works in Las Vegas. If You have visited Las Vegas in the last few months You have already seen this this project. The Linq is the name of the complex, the wheel itselif is the HiRoller. 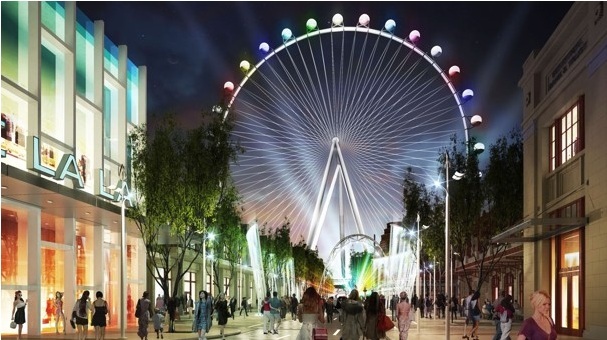 The Observation Wheel will be the largest in the world, eclipsing The London Eye by 107 feet and 9 feet higher than the Singapore Flyer The height will be 550 feet and will cost 550 million. As You can see from the picture above it will include a shopping and entertainment venue. The entrance to this complex will be where O'Sheas presently sits. O'Sheas, as it is seen today. Take plenty of pictures, this will never look the same once this project is fully under way. Observation Wheel to be named "High Roller"
The Las Vegas High Roller will be positioned parallel to the Las Vegas Strip. There will be 28 air-conditioned bubble shaped compartments that will hold up to 40 passengers. When all compartments are at capacity, more than 1,100 people would be on board. A complete revolution is expected to take 30 minutes. That time defies common sense, I expect that time to be a bit more. So far, plenty of ideas have been presented as to what each compartment will provide. Ideas such as Weddings, diners, sunset or midnight cocktails and just general sightseeing. "Skyvue, a 500 foot, 100 million dollar project is already under construction across from the Mandalay Bay Resort on the South Strip. In Typical Vegas fashion competition is already present before this idea is a proven success. The Skyvue might even beat the High Roller to opening day, therefore, making the High Roller the "second" observation wheel. This Wheel will also provide dramatic views of the Las Vegas Strip, all of the view coming from the north whereas the High Roller will get its views from both North and South. Imperial Palace as it is today. The first phase of this project is already in progress, that is the complete remodeling of the Imperial Palace. 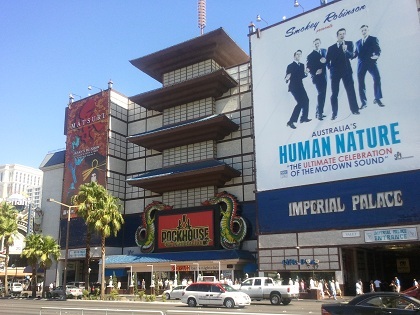 The Imperial Palace will remain in its location but will be completely gutted and most likely be renamed. The entrance to the new resort will be inside the new High Roller Venue.